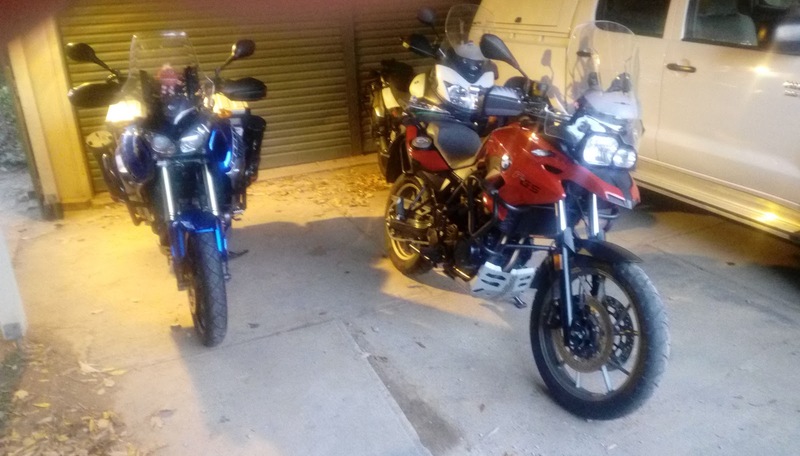 So - after a few busy days, all 3 bikes are lined up in our carport & ready to go. Minor 'adjustments' made to Marco's VStrom & Ursala's BMW. Throttle locks, & extended footpads for the side stands. Some basic shopping this morning and the usual last minute scrambling trying to find bits-and-bobs. The forecast for tomorrow is cold & frosty with some local fog. Hopefully it will lift and allow us to get going reasonably early. We have a rough route in mind - heading to Wellington for the night then on to Mt Kaputar near Narribri for a Wednesday night camp in National Park. We will then decide if we head down to Byron to catch up with friends & celebrate birthdays or head north into Queensland. This decision will be based on the weather. Some moisture heading down to SE Queensland & Byron from the tropics - so rain is a possibility. We shall see!